Myrtle Beach Mall in North Myrtle Beach is situated between Barefoot Landing and Restaurant Row and is anchored by Belk, JC Penny, and Bass Pro Shops Outdoor World. 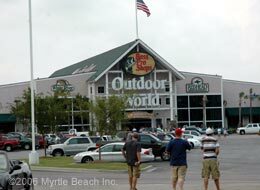 Myrtle Beach Mall, known formerly as Colonial Mall, and previously as Briarcliffe Mall (it's located by Briarcliffe Acres), is also the location of the only Islamorada Fish Co. in South Carolina. New stadium seating theaters recently opened as well.